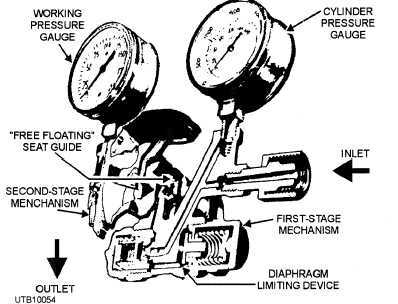 Home > Construction Training Manuals > Utilitiesman Volume 01 > Figure 3-54.Two-Stage Regulator. regulator mechanism consists of a nozzle through which the high-pressure gases pass, a valve seat to close off the nozzle, a diaphragm, and balancing springs. These items are all enclosed in a suitable housing. Pressure gauges indicate the pressure in the cylinder or pipeline (inlet), as well as the working pressure (outlet). The inlet pressure gauge, used to record cylinder pressures, is a high-pressure gauge. The outlet pressure gauge, used to record working pressure, is a low-pressure gauge. Acetylene regulators and oxygen regulators are of the same general type, although those designed for acetylene are not made to withstand as high a pressure as those designed for use with oxygen cylinders. In the oxygen regulator, the oxygen enters the regulator through the high-pressure inlet connection and passes through a glass wool filter that removes dust and dirt. Turning the adjusting screw IN (to the right) allows the oxygen to pass from the high-pressure chamber to the low-pressure chamber of the regulator, through the regulator outlet, and through the hose to the torch. Turning the adjusting screw to the right INCREASES the working pressure; turning it to the left DECREASES the working pressure. The high- pressure gauge is graduated in pounds per square inch from 0 to 3,000 and in cubic feet from 0 to 220. The gauge can be read to determine cylinder pressure and cubic content. Gauges are graduated to read correctly at 70F (21C). The working-pressure gauge is graduated in pounds per square inch from 0 to 150 or less, from 0 to 200, or from 0 to 400, depending upon the purpose of the regulator. For example, on regulators designed for heavy cutting, the working- pressure gauge is graduated in pounds per square inch from 0 to 400. The TWO-STAGE regulator is similar in principle to the single-stage regulator. The main difference is that the total pressure drop takes place in two steps instead of one. In the high-pressure stage, the cylinder pressure is reduced to an intermediate pressure. In the low-pressure stage, the pressure is reduced from the intermediate pressure to a working pressure. A typical two-stage regulator is shown in figure 3-54. WELDING TORCHES. - The oxygas welding torch mixes oxygen and MAPP gas in the proper proportion and controls the amount of the mixture. at the welding tip. Torches have two needle valves: one for adjusting the flow of oxygen and the other for adjusting the flow of MAPP gas. Other basic parts include a handle, two tubes (one for oxygen and another for MAPP gas), a mixing head, and a tip. Welding tips are made from copper and are available in different sizes to handle a wide range of plate thicknesses. Figure 3-54. - Two-stage regulator.